يشكل فندق Titree Resort Holiday Apartment بموقعه الممتاز في منطقة شواطئ, سياحة ضمن مدينة بورت دوجلاس، مكاناً ملائماً لقضاء العطلة بعيداً عن عجقة أيام العمل. يمكن من هنا للضيوف الاستمتاع بسهولة الوصول إلى كل ما تقدمه هذه المدينة النابضة بالحياة. سوف يعشق النزلاء موقع هذا الفندق، فهو قريب من أهم المعالم السياحية في المدينة كمثل ‪Bally Hooley‬, رينفورست هابيتات, Cloud Nine Guitars - Custom Hand Crafted Acoustic Guitars . يعمل Titree Resort Holiday Apartment على ضمان إقامة مريحة لضيوفه من خلال خدماته الممتازة وحسن ضيافته. يقدم هذا الفندق العديد من الخدمات الكفيلة بإرضاء أكثر الضيوف تطلباً. لقد جهزت هذه الإقامة الفندقية بعناية فائقة لتوفر مستوى عالي من الراحة. في بعض الغرف يجد النزيل تلفزيون بشاشة مسطحة, اتصال لاسلكي بالإنترنت, مكيف هواء, مكتب, شرفة/ تراس. يقدم الفندق مجموعة واسعة من وسائل الراحة المتنوعة، كمثل: مسار جولف - ضمن 3 كم, حمام سباحة خارجي, ملعب تنس, حديقة. إن Titree Resort Holiday Apartment هو خيارك لخدمة الفنادق الراقية في بورت دوجلاس. The apartment we stayed in was old and dated. It was tidy but there were some cob webs around and we saw a few cockroaches in the night (unavoidable in humid weather?). The swimming pool with the spa was ok for a dip. Accommodation in Port Douglas is expensive so for the price we paid, this was satisfactory. If we returned to Port Douglas I would probably pay more for a better place. Scott was easy to deal with and even gave us a free upgrade. The pool was so good after all the hot weather and the apartment was like new. There is a bottle shop and takeaway across the street and IGA really close by. Very easy for self catering holiday makers. Very spacious rooms with all the essential extras. A little bit far away from Macrossan St. restaurants & bars but easy drive. Extra low special room rate was terrific. Would be good for families with tennis courts & a nice pool. This resort not just for guest. Local or other people living at other units Untill late night there was noise at swimming pool. Exceeded our expectations. Place was modern and clean. Had everything guests would need. Had a good location if one needs a quiet place. Just 5 minutes from the city centre. We booked a one bedroom unit but were given a two bedroom unit, so we had lots of space. Would definitely stay here again when in Port Douglas. We had a wonderful stay. The unit was very well equipped & everything worked properly. As an owner of holiday accommodation , i pride myself on cleanliness of our property.I would not want guests arriving and having to clean it before they feel comfortable in their surroundings.Very disappointed . The Pool, tennis court and other outdoor facilities were great but there was so much around we hardly got to use them. 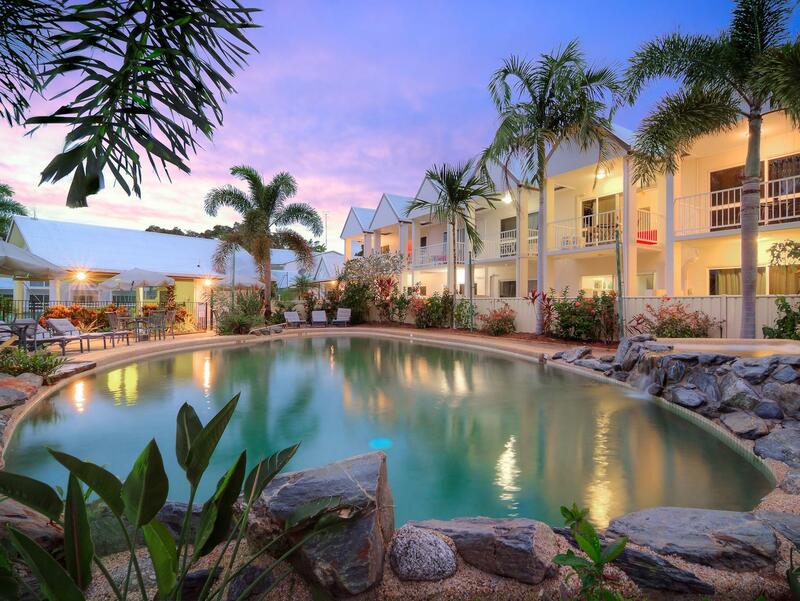 Port Douglas is such a great place for an active or relaxing holiday it has it all. Stayed for a week in July 2018. Management very friendly and helpful in all respects, from booking the room to helping us find the most suitable Great Barrier Reef tour. The room was excellent; fully equipped kitchen and living area downstairs, with two double bedrooms, bathroom and laundry upstairs. There was a lot of storage space, and all of the equipment worked well. We enjoyed using the tennis court but the net was too low and couldn’t be raised and the tennis racquets were too small and a bit worn out. The pool was in a relaxing landscaped area near the free BBQ. The resort is opposite a small group of shops that includes a brilliant cafe (OTZ) which serves breakfast and lunch year round and dinner on Wednesday and Friday nights in winter. Easy (walking) access to an IGA and a short drive to Macrossan and Wharf Streets, where the majority of restaurants are, as well as the main shopping complex. Our room was excellent value for money and I highly recommend Ti Tree Resort. We stayed in the two bedroom apartment. 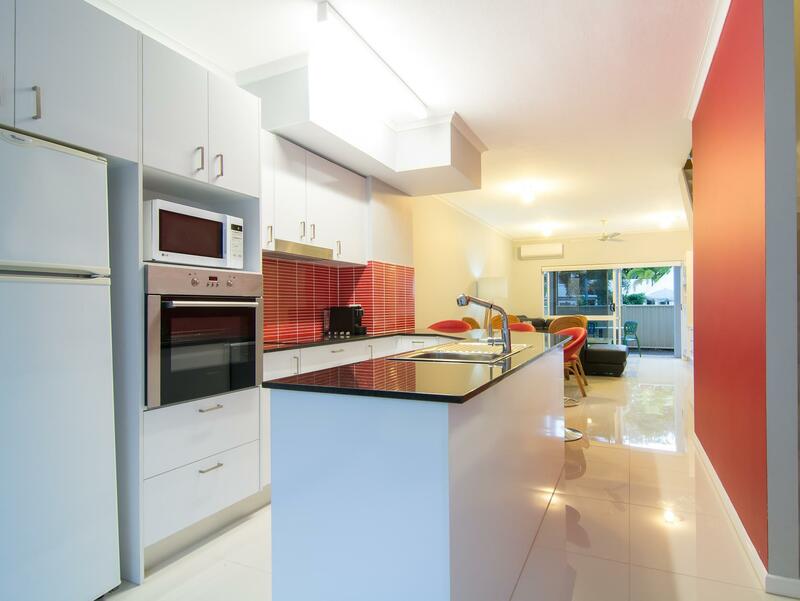 Super comfortable and clean and located outside the hustle and bustle of busy Port Douglas main shopping strip, which is only a short drive. Stayed with two older teenagers. Very close to the beach, shops and eateries. It is a long hike from the main town but well worth the walk along the beach. The units are spacious and comfortable. Large apartment that could accommodate 4 people. Great to cook at home and quiet area within walking distance to the beach. quiet place, clean and nice accomodation. No problem for our check in late at night time. Check in and out very quickly. Very close to beach just few minute walk. Very nice kitchen and apartment. Easy access. Very friendly staff, especially Georgina. Everything worked as advertised. Great location but the apartment that we stayed was not that clean,hair around the back of the doors, the floor was dusty, the kitchen draws and cupboards were dusty. The balcony was filthy full of dust and dead leaves as well as the front and back verandas of the apartment.